Unemployment is often being addressed by decision makers and unions via e.g. implementing policies, programs and projects that aim to create jobs, (co-) working spaces and platforms or create better conditions for jobs. However, citizens are too little involved in the debate on these work-related aspects. The region of Limburg (BE) faces -especially since the closure of the Ford factory in Genk- a great need for enhancing the public debate on (local) work, workspaces, conditions and tools (to create, find, share or experience work) as well as their organisation in the city/regional space. 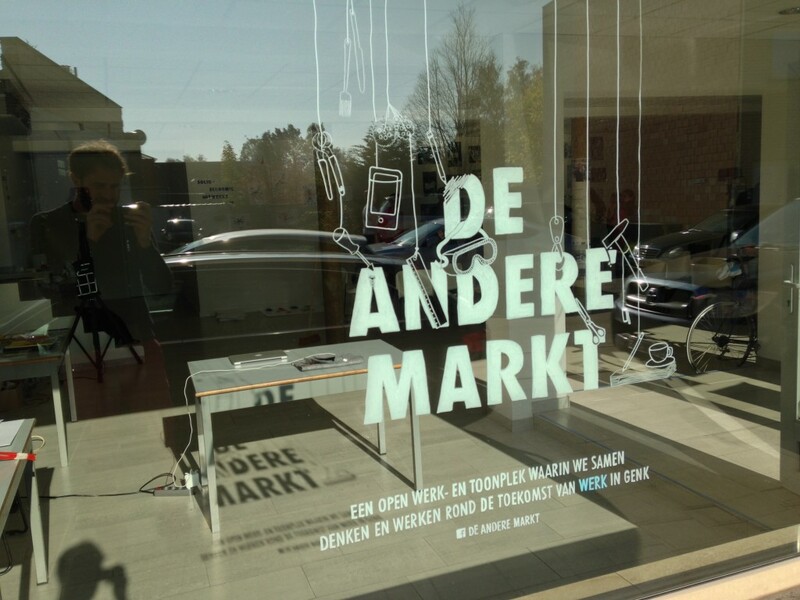 Therefore, De Andere Markt (The Other Market) has set up a Living Lab in Genk (BE, Limburg) for the coming two years. Living Labs are ecosystems where the research is not carried out in closed design studios, but via a systematic participatory approach, integrating research and innovation processes. This particular lab is an explorative platform for researchers/teachers, students, policy makers and local community to collaboratively think and work together on the future of “work”, both oriented at the own neighbourhood as on the broader world. 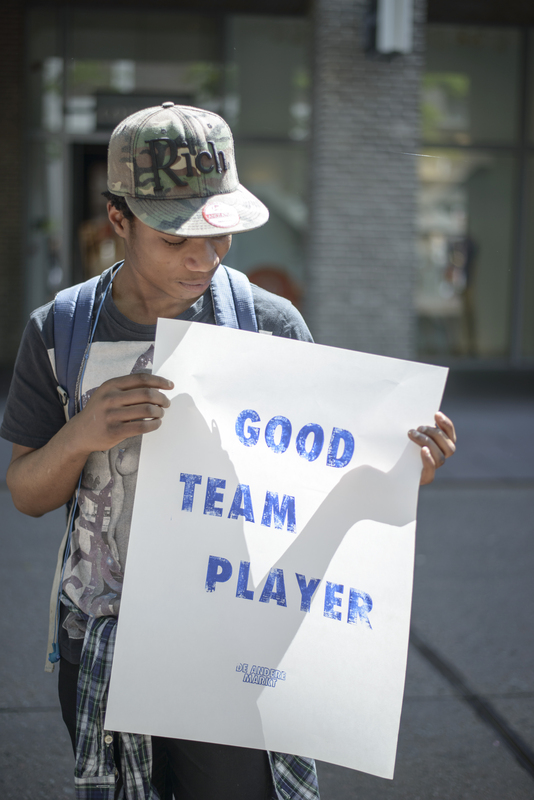 Via interventions, games, prototyping and coaching activities De Andere Markt supports designing or doing future work. We investigate two main questions How can we use design to engage (often marginalized groups of) citizens in (1) the public debate around work, work spaces, tools and their surrounding conditions? (2) How can we co-design proposals for future work, work spaces and tools? By exploring these questions, we want to increase people’s capabilities of contributing to the public debate on work spaces, platforms and tools and their organisation in the city/regional space. Moreover, we want to enhance the (democratic) public debate in the region of Limburg on work with a wider range of actors (employed and unemployed, different cultures, gender groups, young and old, etc.). Via this public debate we want to come to new design proposals for work, work spaces and platforms. Finally, we want to connect these proposals to existing initiatives, institutions and organisations. To enhance the chance for citizens to be heard in the public debate around work, we will create supportive actions and tools. 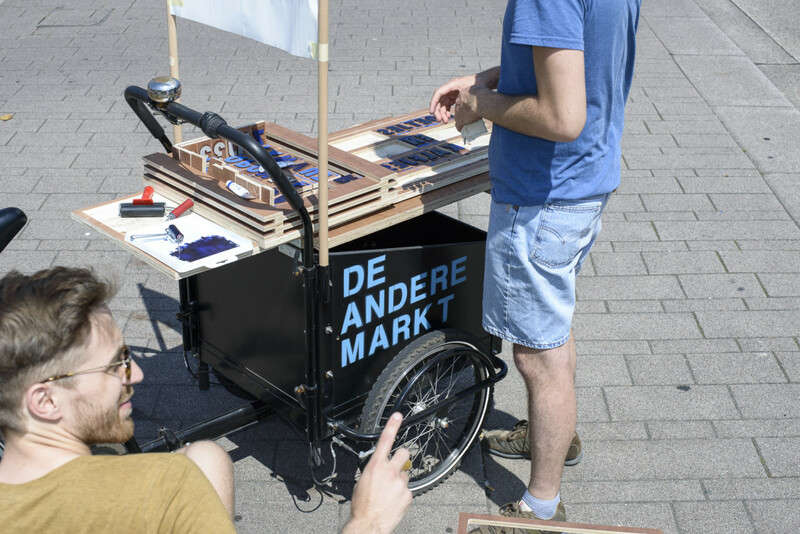 We collect stories about the skills of inhabitans and (small) organisations in Genk via our shopfront in the city of Genk and a mobile market, a cargo bike with which we ride through Genk. 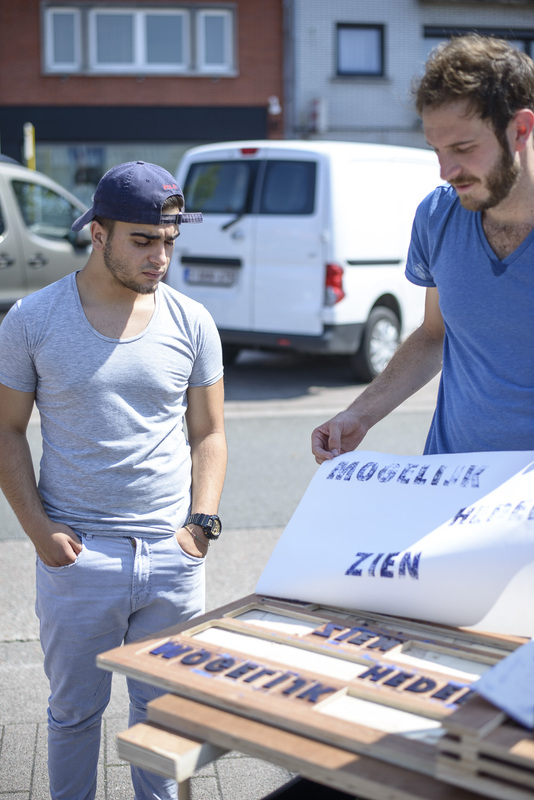 The shopfront and mobile market are conceived as a kind of reversed employment agency: we collect and display stories about local skills and conceptions of work, instead of jobs. We conduct interviews under the form of individual creative sessions where we reflect together with shop owners and entrepreneurs on how their businesses are functioning and what are the economic and social networks they form. We organise Minilabs, wherein we generate new ideas about the future of work through co-design processes at fixed moments in time. Inspired by stories collected in the streets and in the local businesses, these labs are set up as brainstorms between citizens, researchers, professionals and policy makers. Next to the Minilabs, we organise Gamelabs wherein serious games are used as vehicles for participatory prototyping and/or simulations. Abstract, intangible notions such as work or economics are made more concrete by collaboratively prototyping ideas and games. These games will then act as visual tools that support a process of coproduction and participatory design of new types of work, workspaces and tools. We organize Designlabs wherein ideas can be materialised into platforms, tools, objects, services or spaces. The most ‘visible’ and physical outcomes of these labs can be proposals/prototypes for the future of work, work spaces and work tools. We organise coachingtrajectories to enhance the opportunities of systems, products, services, tools or organisations that are generated during the labs to genuinely contribute to the debate about the future of work. All the interventions, labs and outcomes are publicly shared via our website, forming De Andere Markt media channel. We pay great attention to developing tools that support citizens, policy makers, designers etc. in contributing to mediated public debates on work (focused on participatory production of media). Thank you Astra. Looks fantastic. We should meet him and talk!